I imagine a large, imposing brick wall. Upon closer inspection I notice that, while the wall is solid, it's not impenetrable. Upon even closer inspection, I detect the faintest whiff of something delicious. Resolute to claim whatever lay on the other side, I set about smashing into the wall. After hours of chipping away, the wall tumbles down. On the other side, a perfect stack of mouth-wateringly fluffy pancakes. Immediately beyond the pancakes, another brick wall and, again, an intoxicating aroma emanating from within. The cycle of Dark Souls is essentially the same: Hours of diligent, often frustrating work followed by a surprising, often spectacular payoff. I just hope you really love pancakes. Functionally, Dark Souls is so fundamentally like its forebear, Demon's Souls, that it's tempting to simply copy Alexander's review from 2009 and call it a day. There are some significant changes to Dark Souls, changes that are worth noting but, by and large, the experience remains the same. Once again, players are beset on all sides by vicious enemies, hidden traps and, at nearly every step, calamitous drops. Death, which comes often, means the loss of all the souls – and "humanity," which I'll explain later – acquired by slaying enemies. Said souls are used as currency for everything, from purchasing new items to leveling up one's character, so they're kind of important. Upon reviving, players have one chance to reach the area of their demise and reclaim their souls. If you die before reclaiming them, they disappear, forever. 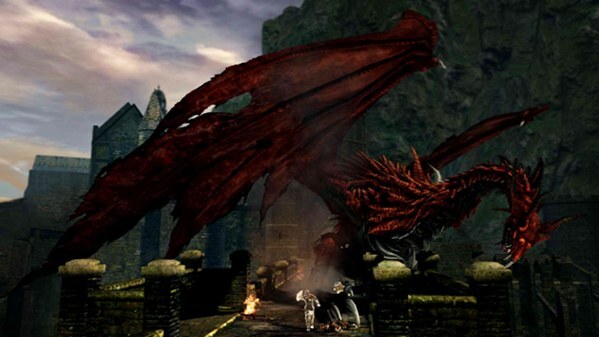 It's the same mechanic that drove Demon's Souls, though Dark Souls adds a few new elements to the formula, the first being the new bonfire system. The world of Lordran is dotted with bonfires that allow players to replenish their life, level up their character and revive to human status. Reviving requires "humanity" which can be earned from enemies or purchased in some stores. Human status increases the rate at which rare items are discovered and, more importantly, allows players to summon phantoms (i.e. other online players) to aid them in battle. Given the very unforgiving nature of Dark Souls, I don't think I need to explain the benefit an additional player can bring to the table. Perhaps the biggest difference from Demon's Souls however, is the open world of Dark Souls (which necessitates the new bonfire system). I say "biggest difference" and I mean it. The world of Dark Souls is huge. Very, very huge. I've been reminded of this at nearly every opportunity, as every new area seems to introduce an expansive panorama of a different area in the distance. This isn't window dressing either. The distant areas are real, explorable places. That castle on the horizon? It's the same one you traversed hours ago. Honestly, after the initial shock of Dark Souls' brutality sets in, gaining souls and leveling my character became secondary to my real mission: Seeing what comes next. The living, breathing world – with nary a loading screen – is constantly serving up something new. I've braved the booby traps of Sen's Fortress, explored the haunted ruins of New Londo and survived the teetering heights of Blighttown, a festering city far beneath the ground. And all of these places are teeming with unique creatures, from the crystal giants of Darkroot Basin to the gleaming knights of Anor Londo and the spider demon Queen Quelaag. Granted, these creatures (and indeed these places) aren't interested in striking up a conversation. Their primary concern is ending your life as often as possible, but I couldn't help but be awed by their mere existence, menacing though it may be. Make no mistake, however, every bit of joy in Dark Souls has to be earned with blood, sweat and souls. Enemies will crush you. Even the lowliest foot soldier can often serve up a surprise one hit kill. Ambushes wait around every corner and treacherous falls seemingly surround every walkway. In short, Dark Souls stacks the deck against you at every turn, and not only by thrusting every monster in the book at your lonely hero. Beyond a very basic tutorial, Dark Souls does almost nothing to explain its many complicated systems, and the anemic instruction booklet doesn't do much to elucidate them either. Furthermore, the open world of Lordran, while impressive, is very confusing at first and players aren't given much direction. It's easy to go the wrong way and, thanks to the game's difficulty, it's easy to assume you're going the wrong way, only to realize later that you're expected to press through a seemingly impossible area. Other things rankle as well, my personal gripe being that there doesn't seem to be a way to compare merchant's items with the ones you already have equipped (a feature found in just about, oh, every RPG ever). The controls can be fidgety at times, making difficult maneuvers even more difficult, particularly jumping. Still, after a while, I began to interpret these strange choices as just another facet of Dark Souls' relentless difficulty. After a few hours – about fifteen in my case – things begin to gel and the walls of Dark Souls start to crumble, revealing the delectable treats within. This review is based on retail copies of Dark Souls provided by Namco Bandai. 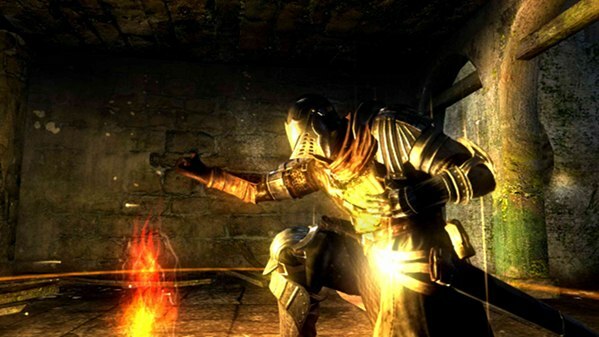 Dark Souls will be available on Xbox 360 and PS3 October 4. The game was played for approximately 38 hours, though not to completion.